DuckDuckGo - What Is It and What Can You Do With It? DuckDuckGo is a great search engine that delivers effective, fast, relevant results, and is especially attractive if you're keeping track of how information is gathered about you online. DuckDuckGo's results pages are not paginated, making it easy to scroll down and find what you're looking for quickly. Favicons (the small images that show up in the address bar, unique to each site) are displayed next to search results for instant recognition of your favorite sites. Instant answers called "zero-click info" show up delineated by a red outline at the top of your results, depending on what your search query is. 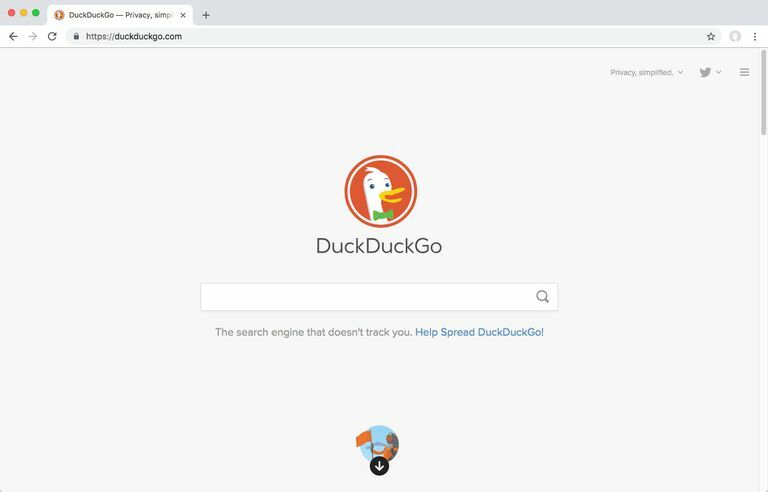 DuckDuckGo gives searchers the ability to search within any site, using either the drop-down menu next to the main search box, or the "bang" search shortcut (an exclamation point used in tandem with the name of the website). There are hundreds of DuckDuckGo bang shortcuts, covering a wide multitude of sites varying in topics from Research to Entertainment. In addition to the shortcuts given above, DuckDuckGo offers what they call goodies, an intriguing array of all kinds of search shortcuts, anything from special keyboard shortcuts to specialized cheat sheets. "DuckDuckGo prevents search leakage by default. Instead, when you click on a link on our site, we route (redirect) that request in such a way so that it does not send your search terms to other sites. The other sites will still know that you visited them, but they will not know what search you entered beforehand . . . DuckDuckGo takes the approach to not collect any personal information. The decisions of whether and how to comply with law enforcement requests, whether and how to anonymize data, and how to best protect your information from hackers are out of our hands. Your search history is safe with us because it cannot be tied to you in any way." Privacy is becoming more of an issue for many people as the internet continues to evolve. If you are concerned with privacy and you enjoy a simple, uncluttered interface with plenty of shortcuts, then DuckDuckGo would probably be a good choice for you as a search engine. Need to time something—a cooking turkey, how long it takes you to finish that spreadsheet, maybe do a few laps? You can do that with DuckDuckGo; simply type "stopwatch" into the search bar and you're good to go (literally). Quick dictionary definitions are only two words away with DuckDuckGo; just type "define" plus the word you're searching for, and instant definitions will be returned to you. Sure, you can find information about movies, simply by typing in the name of your favorite film. However, perhaps you want to find a movie that includes a particular actor or director. Just type "movies with Chuck Norris" or "movies directed by Mike Nichols" and you'll get a list of instant answers. Local weather or weather halfway around the world, either way, you'll be able to find it easily. The search engine automatically determines where you are located for the local weather; if you're looking for weather in another town, city, or country, simply type the place name and weather and don't worry about punctuation; i.e., "Chicago Illinois weather." DuckDuckGo gives searchers the ability to search within SoundCloud, an online streaming music service, for virtually any musical artist. Just type in what you're looking for plus the word "soundcloud," i.e., "daft punk soundcloud," and start listening. Need to impress someone with your culinary skills? Try looking for recipes with ingredients you already have on hand. For example: "salmon recipes," or "quinoa recipes," or "Christmas recipes." All come back with impressive results. Need to figure out ounces to grams, feet to yards, or inches to centimeters? Type in what you'd like to convert and DuckDuckGo will automatically calculate that for you. Example: "8oz to grams". Whether you're looking for something in your local area that you haven't tried yet, or you're in a new city and you're unfamiliar with what's available, this particular feature can come in handy. Remember, this search engine automatically picks up where you are located, so if you want to find restaurants in your area, just type in "restaurants near me." "bars near me," etc. DuckDuckGo promises web searchers that it will not collect, store, or share personal information, and it goes to great lengths to back up those promises. In fact, one of the most popular features are their privacy settings—they don't keep track of what you're searching for. This can come in particularly handy if you're looking for saucy images like "images of cats wearing sweaters." There are literally millions of videos on the web, and it can get somewhat overwhelming when you try to search for something specific. DuckDuckGo tries to limit that frustration by providing quick shortcuts to popular video searches; i.e., "jimmy fallon videos."